The sun came out! 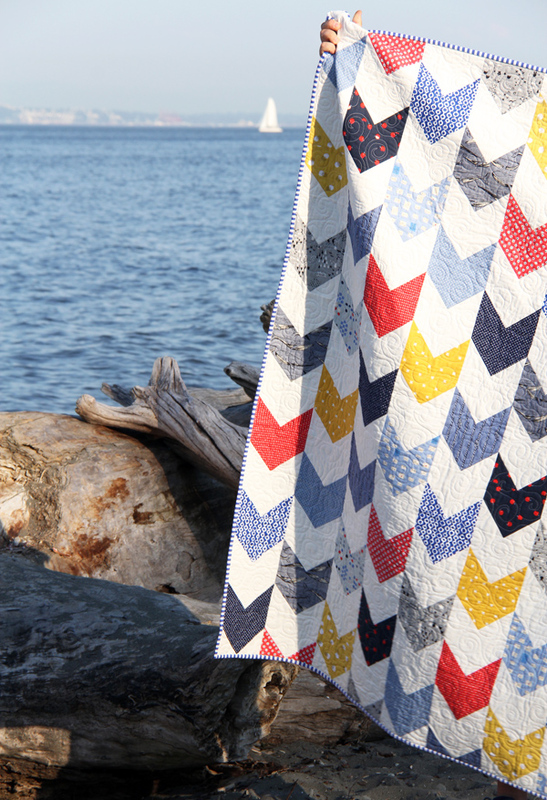 My husband loves when the sun comes out…it means I haul all my quilts around and he gets to hold them up for photos. Just kidding he hates it. ;) Can you spot the hazy Mt. Rainier in the picture? I’m sharing my One Way quilt and pattern today. If Pow Wow had a little brother it would be this pattern. It has a very similar look, but is constructed differently and without sashing (yay!). Between the two I’d say this one is easier, and I like the look of the arrows against each other. The fabrics are mostly from the Cotton and Steel Bluebird collection with some other basics thrown in. 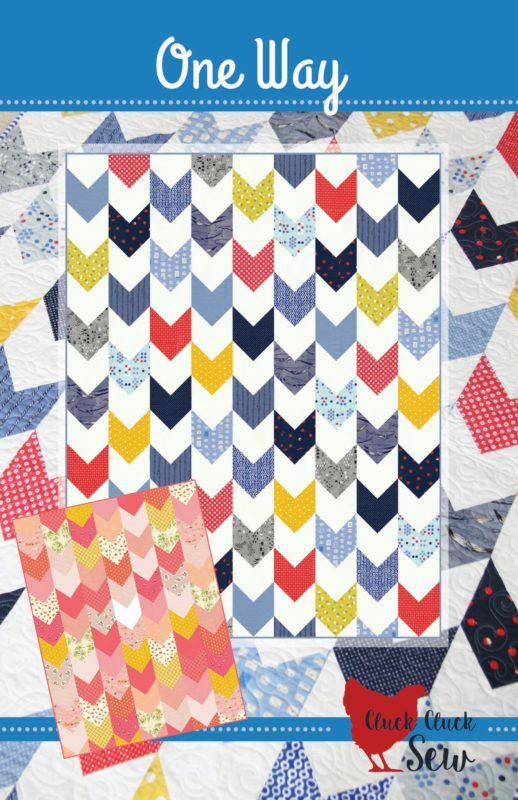 The pattern has 5 size options, and also includes instructions on the back page to make an all print version like the baby quilt below. It’s a bit more work to layout so I wouldn’t recommend making an all print version like this in a large size, but you could make the solid background version with different low volume prints or one color prints and it would look just as amazing. The prints in this pink version are almost all from Heather Ross for Windham Fabrics, with some basics thrown in from my stash. Pink and yellow make me happy! The pattern is in my shop. My newborn baby Jane turned ONE this week! How how how did one year already fly by?!!!!! My heart…I seriously can’t take it you guys! She just keeps growing! 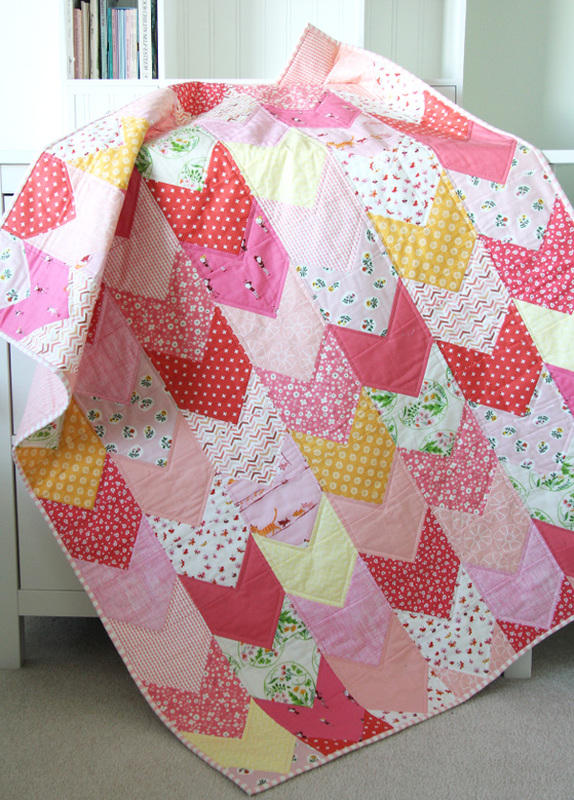 Love this pattern – it is beautiful – and no sashes :)! 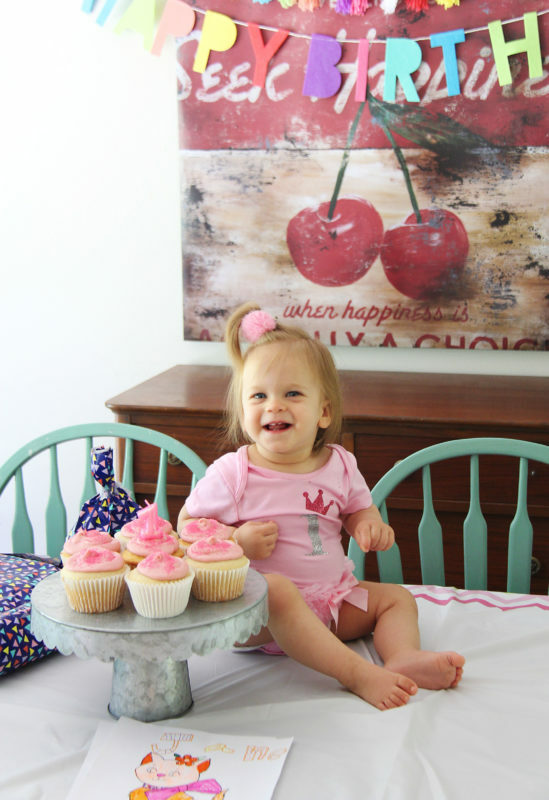 Little Jane already 1 – Happy Birthday Jane! She’s just precious! I love the pattern. Thanks! I love the pink version! Great pattern. 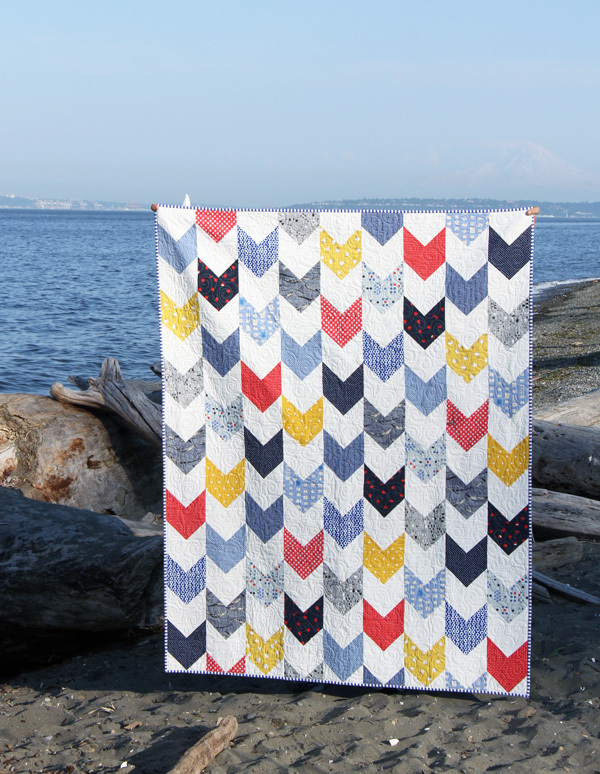 Love this quilt, and I’m seeing it in Washington, having just flown over Mt. Rainier. I usually read your posts from Wisconsin. Thanks for your creativity. I’m really drawn to this quilt, both versions. Your beautiful Jane has hair! Our great granddaughter, Bella will be 1 on July 7th, so they are only a month apart and she has nearly no hair. Just a bit of strawberry blond fuzz, Guess it’s less work for Mama, though. Haha, my husband “loves” holding up my quilts for photos too. But yours doesn’t bunch up the corners! I have several of your patterns and have to say, they are the best written ones I’ve ever used. Cute baby! I was going to go on and on about “One Way” and then I saw Jane…no…I’m in love with that baby!!! She is adorable!!! I can’t tell you the joy we have had watching baby Jane grow, we absolutely love her hair! If her personality matches her hair she must be a joy to be around. Happy Birthday Sweet Baby Jane!!! How did that happen?? Seriously though, what a sweetie! I think having kids magnifies time! I know when I look back at Before Daughter and After Daughter the perception is really different. Then again, the older you get, the quicker time goes! I better quit! Jane’s a cutie. She looks like such a happy baby. Jane is so cute. 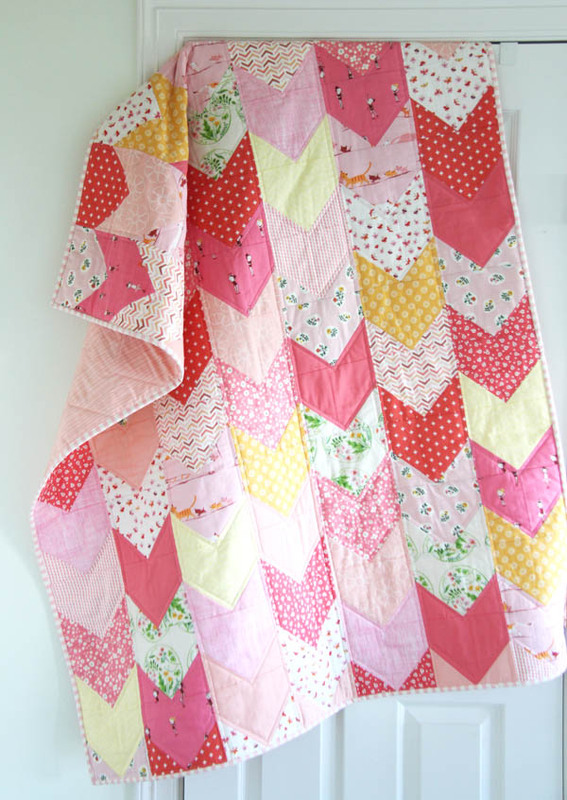 I love the quilt both ways, really love the colors. Happy Birthday dear baby. Time does go way too fast. My heart signs with pink & yellow together, too. LOVE this pattern! You just keep nailing it! Little Jane – what a little dolly! Wow, I cannot believe that Jane is 1 already! Enjoy every precious moment…time goes so fast. Your quilt pattern looks great. I can see it done in so many colorways for different recipients. Your quilts are great! I can sew from a pattern to make skirts and dresses and such, but I have never quilted. Would you consider this pattern a do-able starter? I love the way it looks! I LOVE the pattern! Your little one Jane is a 1 year old already shes adorable, gosh time flies. Enjoy every minute of it, I should know my children are all grown up…but we have a grand baby on the way and it’s a girl, yay!!! I enjoy reading your blog thanks for sharing! Happy Birthday to little Jane – yes, the time flies by way too fast! As usual, love all your quilts and tutorials – thanks so much! Love the third picture. And the pattern looks fun. 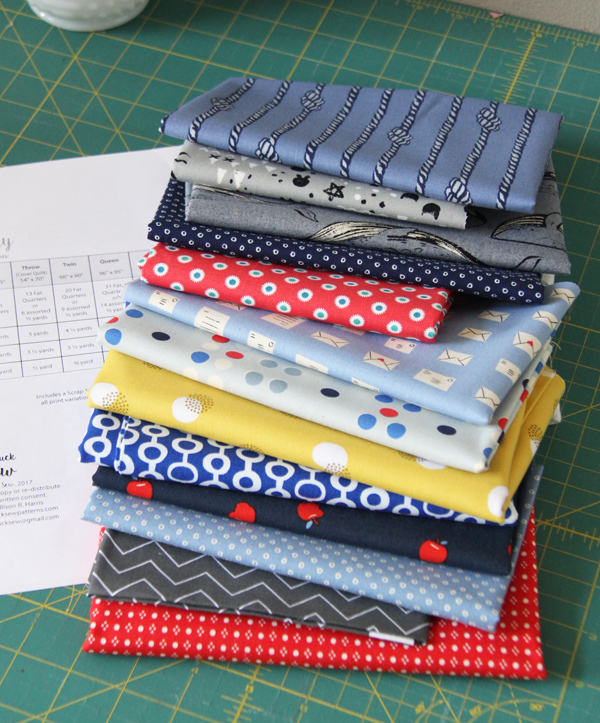 Always good to have some pinned inspiration when the next baby quilt wants to be put together. 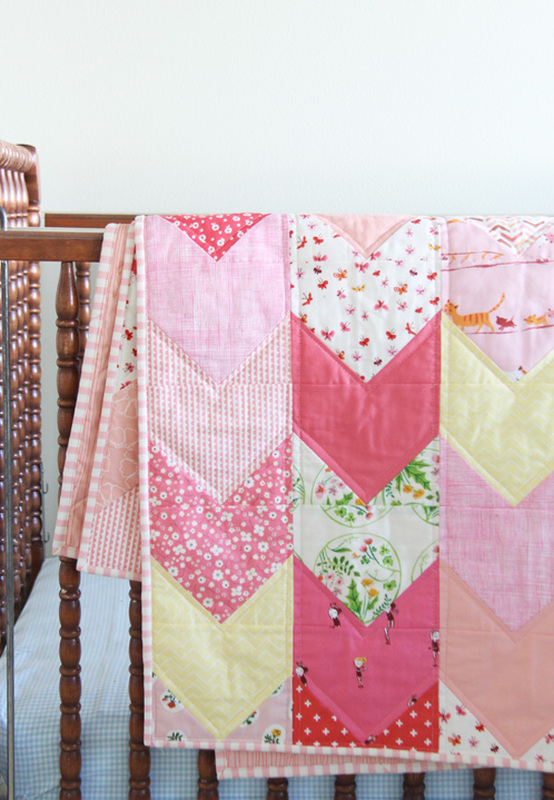 I love the pink/yellow quilt. And Jane… aww, so sweet. What a lovely little human bundle to hug and kiss. You and me both…fastest year ever! Hope you are doing well it’s been too long since I’ve seen you!!! Oh that’s lovely! And yes I know what you mean about the books – there are some I can’t start without knowing that I’ve time to finish, even though I already know the story back to front! !